CHULA VISTA — Before Chula Vista’s 556-acre Bayfront Master Plan can move toward reshaping San Diego’s South Bay, a defunct power plant must be demolished. The power plant, long an obstacle in the path of developing the waterfront, is now scheduled to be taken down in one large implosion, amending an earlier plan that included two separate detonations. 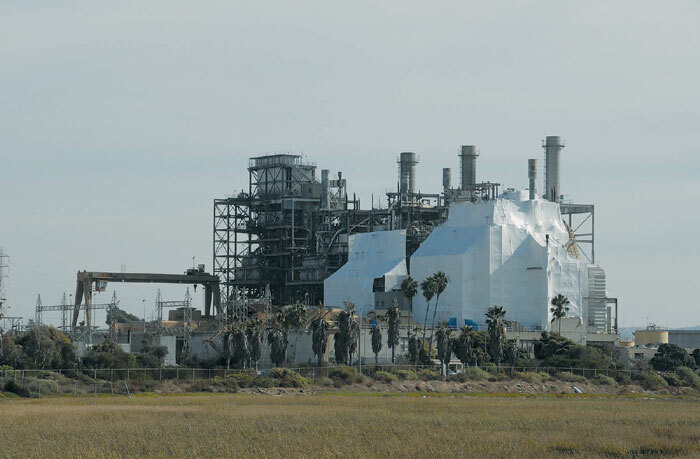 The plant’s demolition was originally approved by the California Coastal Commission June 14, with the plant’s previous operator, Dynegy South Bay LLC, and demolition team Silverado Contractors planning a two-phase implosion. To minimize impacts to the surrounding communities, Dynegy submitted an amendment of its demolition permit to the Coastal Commission. With a single implosion, noise levels would be reduced, the need to re-route traffic in the immediate area would be lessened and the demolition schedule would be shortened by approximately two months. Since the plant’s final decommissioning in 2011, Silverado has been dismantling parts of the structure — including pipes, lights, controls, duct work and tanks. Warehouses, storage buildings, tanks and other ancillary equipment are being removed using heavy equipment. Dynegy South Bay will outline a revised demolition timeline to reflect the single implosion event, and the implosion could take place as early as November. The project’s total cost is estimated at $60 million for demolition and mitigation, and it is expected to generate about 21,000 tons of recyclable metals — including iron, steel, aluminum and copper. It may also generate up to 3,400 tons of other non-hazardous waste, such as wood or plastic, which will be recycled, as feasible. Once the power plant is removed, the Chula Vista Bayfront Plan will move one step closer to reality. The Coastal Commission approved the plan Aug. 9. Costing an estimated $1.5 billion to $2 billion to implement over the next 20 years, the Chula Vista Bayfront Master Plan is expected to create 7,000 construction jobs, 2,200 permanent jobs and generate a projected $178 million in revenue for the city and the port. The project will be implemented in four major phases over a 24-year period, with the first phase to include the development of a resort conference center, creation of public parks and open space, restoration of habitat areas and construction of a new fire station, RV park and mixed-use residential development. Construction on the first phase could start by 2016.